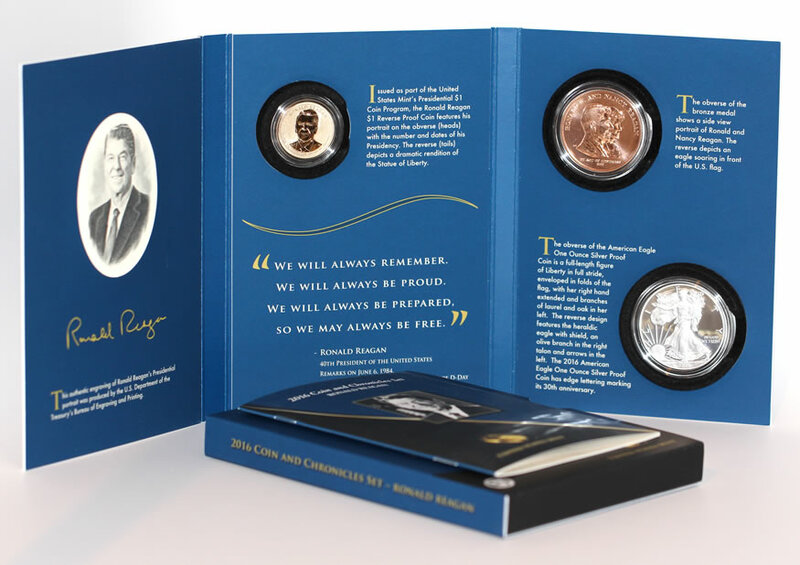 Ronald Reagan Coin & Chronicles Sets climbed 3,190 during their first full week of sales, according to the latest U.S. Mint figures, raising their total to 28,083. Unlike sets from last year that include different collectibles and had lower mintages, it’s fairly apparent that the set for Reagan will not sell out. Less than 19% of the originally allotted 150,000 have been claimed. That’s kind of a buzzkill. They’d hit 50,000 by year’s end if new sales averaged about 2,000 a week. That seems possible … it is the time of year when the U.S. Mint normally ramps up marketing for fall and holiday shoppers. It’s too bad that the set includes a proof Silver Eagle, which is also sold separately, because the two compete against each other. I don’t think it’s a coincidence that the standalone proof advanced by only 650 in this round. That is — by far — its worst weekly increase since launching in September. Going forward with the newness of the Regan set fading, the standalone Silver Eagle will win the weeks because it’s cheaper and collected annually. Make sure to visit CoinNews later in the week. We have an article queued for Friday morning that includes more than a dozen photos of a Reagan set with its two coins and medal. The U.S. Mint published sales data for 242 numismatic products. Sixty-seven of them outperformed their prior weekly sales compared to 96 previously. Five products increased by more than 1,000 units compared to 6 previously. One product had its sales total reduced compared to 4 previously. Below are tables showing the latest sales for U.S. Mint numismatic products. The sales period covers Oct. 17 to 23. Products with an asterisk (*) are no longer available. 50,000 would have been plenty with a limit of 5 limit per household…. But 150,000????? What are they thinking?????? My Reagan set was lost in the fiery crash of the Fedex truck in Utah on 10/19/16. Sorry to say two people were killed in the crash. Everything in the double trailer was burned to a crisp. Whistler – I bought three, but I have no idea why. I had no idea that coin sets were that popular. Not my thing, but to each their own. Happy collecting folks. I enjoy reading the data stats, very informative. Great information for all collectors. Thanks Coinnnews. If they went with a silver version of the Reagan inaugural medal, instead of the Walker, sales would have been much higher. I agree, the RR set would have had higher sales by now if the Mint had just included a silver medal instead of the very common 2016 proof ASE. on the plus side for about $15 more than the price of the ASE you get the set with RP dollar & medal…. but why would anyone pay $150+ to get the set slabbed?